Nowadays my family sees me more with my laptop on the kitchen counter than my recipe file or a cookbook when I decide to cook something. Over the last year or so I have started saving recipes to .PDF instead of printing them out on paper. The benefits are many! Easier to organize. Make as many folders and subfolders as you like! 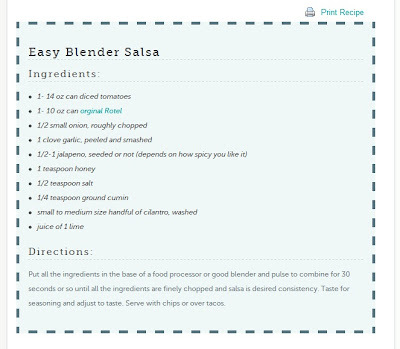 Save the recipe WITH the pictures…just the way it appears on the website you got it from. Here are a few screen shots of my Recipe “Book”. This is my computer’s directory. I have a folder called Recipes in my Documents folder. So far I’ve only organized them into Gluten-Free and everything else. All you do is click on any of your .pdf files in the folder you have them saved in, and the full recipe will open up in Adobe Reader. First, head on over to cutepdf.com and download their FREE PDF Writer program. It’s 3.9 MB’s and took me less than a minute to download. 1. Open your original document and select Print command in File menu of your application to bring up Print dialog box. 2. Then select CutePDF Writer as the Printer to print (DO NOT select “Print to file” option). 3. You will get a Save As dialog box prompt for saving created PDF file. 4. Go to that folder to find your PDF file. If you run across a recipe you like online (like THIS ONE I found today!!! )…click on the “Print Recipe” link/icon and follow the same directions as above. If you decide you want to print it out on paper….to share with a friend or whatever….just click “Print” and instead of choosing the CutePDF Writer….choose to print to your actual printer. It’s as simple as that. If you have any questions…leave a comment below and I’ll do my best to help you out. I’ve been doing this for years and LOVE IT! I have a huge collection going, and can separate into different folders and sub folders easily. I also have the dvo recipe software, this is so much simpler. I back up automatically to protect. If there are photos I use word, if not, just notepad. I have a macbook, like yours in the picture. Is their a cute pdf writer for macs? If you have a kindle you can also load PDF’s onto it, through your email. It’s smaller than a laptop on the counter too. I've been saving recipes to Word documents for years. This seems soo much easier. The day is very seldom anymore that I crack open a cookbook for a recipe. When you save them to the computer, there is more than enough room to note any adjustments. I also like to collect several "versions" of a given recipe and put the best of all of them together to make my own. Hmmm- bet you could have never guessed that I am not an "exact measure" kind of cook, could you? Recipes are guidelines, not rules! I save them in Word too. I also sync the folder with Dropbox so I have the recipes on my phone at all times. Comes in handy when you’re at the store and forget what you need to make that certain dish. Anony1…Thank you for that reminder!! How FRUSTRATING for you. GREAT ADVICE! Back up Back up Back up! Anony2….You are so welcome! It is the only way to do it in my book. :-) thanks for stopping by! You are brilliant!! I already had the capabilities to do this on my computer… trying to save my ebooks for my classes. Never thought of this!! You have helped so much! THANKS!! Just don't forget to make a back up file, I did this several years ago and my computer DIED. never to be revived again. So all my computer saved recipe files were lost. I was able to get some back that I had downloaded from the Internet. Anony…that sounds like a WONDERFUL project! I'm going to have to start doing that with my Mom's recipe box too. Thanks for the idea. :-) Lots of possibilities! I'm in my late 20's and very tech savvy but I'm also very sentimental. I inherited my grandmother's recipe cards (and cast irons) and spent hours pouring over them. I love them deeply but I must admit because they aren't my library so they're difficult to cook from on a regular basis. Scanning and saving as PDF! Why didn't I put that together sooner? I'm sure OCR would even recognize her gorgeous handwriting! Thank you very much for this. I'm looking forward to starting this project.